Great location and a clean home! Our Family enjoyed our stay, wish we had stayed longer! We could walk to restaurants and our favorite Cuban Coffee Shop! I highly recommend it, everything went smooth! The staff was very helpful booking my sunset cruise and trolley tour. Awesome! Leslie, Linda and Liz loved our little mango cottage.. It was a perfect getaway -- every detail tended to. Loved the bathing suit pictures and decor throughout. Beds were comfy...sheets and towels top quality. Walking distance to Duval, beach super restaurants. A top quality grocery store just around the corner. Outside deck and hot tub great. The Fury sunset cruise with Cory and his band was a super suggestion from the staff as was the island tour bus and Hemingway house. Can't wait to come back to our little paradise in Key West! Great Location! Great House for Large Groups I traveled with a group of about 8 people. The place is extremely well laid out. There was plenty of room for all of us. The courtyard is a great place to hang out and enjoy the beautiful Key West weather. Its within walking distance to all of the sights and sounds that Duval Street has to offer. Well designed space! My friend and I had a great time in Key West! This home was perfect for our needs. The space is very well thought out for visitors with details like hooks for hanging clothing and towels, a kitchen that is well laid out for vacation needs (we didn't do any serious cooking, but could have), and comfortable beds and bedding. I especially appreciated the well lit bathroom for applying make up, and in this home there was ample lighting available in every room. The shower in the master bedroom is small, but functional, and the other bathroom has a roomy shower. The decor is very attractive and made for a peaceful atmosphere. The home is clean, well equipped, and located an easy walk, about 3/4 to one mile, from almost everything we wanted to do. We did not rent bikes or scooters, walked to most places, and called a cab when we needed to. Thanks for sharing your beautiful home with us, I would stay there again and will recommend to friends. Excellent location and outdoor space! 3 couples stayed at Casa Margarita in January. We loved that we each had our own bathroom and everything was very clean. Check-in and out was very easy and we had a great time. It was great having the pool, hot tub, large deck with a covered area and our own parking spots. The location made it so easy to get to a lot of our favorite eateries on the harbor (Turtle Kraals) and we loved the breakfast place Harpoon Harry's just steps from our house. Duval street is also a short walk. We rented bikes at Eaton bikes and loved visiting Old town bakery just a couple blocks from our house as well. We'll be back! The perfect house for our family getaway! We were 100% happy with the Mango Cottage. It was exactly as described on-line and was just what we wanted. It was in a great residential area that was convenient to everything we wanted to do on our trip. We rented bicycles and road all over the island and looked forward to coming home in the evenings and relaxing in the hot tub. The house is beautifully decorated and in pristine condition. No complaints from our group of 6 AT ALL. Thank you for sharing your house with us. We will be back!!!! To begin with the rental staff was amazing to work with. Very responsive and willing to assist in anything we needed. Beautiful and convenient The home itself was perfect for us. Its not too close to Duval that you have all the noise but easily walkable. Surrounding neighborhood was quiet and clean. The home itself was very clean and everything was in working order. Everyone in our group had their private spaces but we were all still able to enjoy the communal spaces. I hope we get lucky enough to rent this home again the next time we come down to Key West. Perfect for us! Our group included 4 couples with a desire to be together in a common area but with private sleeping accommodations. This eclectic property provided all our needs. It's location on the quieter end of Duval Street was enjoyed by all. We rented bikes and found all of Duval Street accessible. Randy represented the Owner well and the in/out process was painless. The security deposit was returned to us in a timely manner. We recommend this property! 5 STARS ALL THE WAY Yes we had a great time while in Key West as usual. The Mango Cottage was very nice as advertised. The house was fantastic! The central a/c was a great addition to the comfort of a rental property. The beds were very cozy, the baths were very nice and the kitchen was top shelf. I am a finish carpenter and have been for 25 years and noticed that the quality of materials and craftsmanship was excellent throughout the home. Overall I would give this property 5 stars and say it was by far the best property was have stayed at in Key West. We will return! Awesome Vacation Home This is a perfect vacation home! The house is just as it is in the pictures! A great pool/hot tub/patio area. We enjoyed every minute at Casa Margarita. A few minor problems were handled by Kevin within a 1/2 hour of our arrival. The kitchen has everything you need to cook a gourmet meal. It is quiet and private but is close to everything. The 3 bedrooms/3 baths were perfect for 3 couples. Don't pass on this house! The easiest and fastest check in ever! Fun and friendly staff. Impeccable! My husband and I rented this cottage with one other couple for 5 days, and I must say it is by far one of the best vacation rentals I have stayed in. Getting the keys took only minutes, and when we arrived at the property, the central a/c was blessedly cool, and everything was immaculate. The beds were new and extremely comfortable - such a pleasure to climb into at the end of the day. The appliances were all new and scrupulously clean, there were plenty of towels, extra linens, utensils and other necessary kitchen items, along with loads of information on the area and restaurant/sightseeing suggestions. In the mornings we sat in the rockers on the porch and had our coffee as we planned our activities. The property is in a residential neighborhood, very quiet, yet only a 5 minute bike ride (we rented our bicycles from The Bike Shop, which is only a few doors down from the rental) from downtown. Everyone in our party felt completely at home in this beautiful cottage. It has obviously been lovingly restored with a great deal of attention to even the smallest details. We will be back and will most definitely rent this property again. This place is ADORABLE! Mango Cottage was absolutely amazing!! I HIGHLY recommend this place to everyone!! We did a girl's weekend for my bachelorette party and it couldn't have been more perfect!! The pictures don't do it justice. Although the pictures a super cute online, it's even more adorable in person!! It also felt bigger than it looked online. It was immaculately clean, appeared recently remodeled with all upgraded appliances, and was in a super convenient location. Mango Cottage is walkable to Duval (unless you're wearing heels), Higgs beach, a small convince store, and a yummy breakfast spot (Sandy's). BOOK IT NOW!! WOW!!!! This home was perfect! First impression was so pleasing. Check in and out was a breeze. We entered the locked gate and had a lovely front porch with 3 rocking chairs. I enjoyed my morning tea out here . On the side of the house was a deck with a gas grill, table/chairs(1 chair is broken) and a hot tub. It was very private and shady. The house was VERY clean and wonderfully dcorated. Recently renovated, the appliances are like brand new. We used the grill, the starter didn't work and the lighter was out, so we got some matches and were good to go. There are 2 bedrooms, one with an en suite and the other bathroom is directly next to the queen bedroom, so this was perfect for 2 couples. had outlet strips on each side of bed for all our electronics. There is a loft overlooking the living area with 2 twin beds, very small(good for children 5yrs old to teen age. The stairs are very steep! The home was well supplied, each bathroom had a bottle of shampoo and body wash, plenty of towels and there are 6 additional towels in living room for hot tub. The mattresses were very comfortable. Location wise this was perfect, we did a lot of walking but we enjoy the exercise. Within 2 miles is a grocery store, but around the corner is a small grocery store, well supplied. There is a good Cuban take out restaurant diagonal from the small grocery store(we picked up Cuban sandwiches on 2 occasions and brought it back to the house for lunch) A package store near by and the bike rental company is at beginning of street. We got bikes in am and didn't have to return till 6pm next day for $12 per bike, with locks/baskets. I highly recommend bikes, We biked all over the island, a night too(a little scary but bikes have lights in front and back) We went to Higgs beach from house(walked and biked) Everything you need is within walking distance. Mallory square is appr. 35min walk. The most enjoyable house we every rented. You won't be disappointed. If I ever return to Key West I will def. rent this home again!!! Check in was fast and easy. The staff was very accommodating and gave us excellent recommendations and lots of discount coupons. Beautiful Mango Cottage We had a fabulous time in Key West, staying at the Mango cottage. The two extra beds in the loft were a fun place for our kids to sleep. Beautifully decorated, new appliances, hot tub ready and waiting--all of it was a treat to come back to after sightseeing. We did have a car, and parked on the street, however, were able to walk or bike most places we visited. We especially loved having a deck table and chairs to eat outside. Property managers are so accommodating and a pleasure to make your stay perfect!!! I will definitely book this cottage again!!!!! 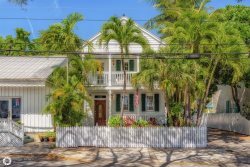 Mango Cottage is a Dream Home accommodation for Key West!!! 10 Stars!!!! My husband and I and two 17 year old grand girls had a wonderful time at Mango Cottage! It is in a great location for walking or biking! Cottage is exceptionally clean and up to date appliances and decor is amazing! Bedding is SO comfortable on all beds! Looks like a cottage out of Southern Living Magazine! You have to see to believe! Girls could ride directly to beach on bikes, and then we all could ride bikes to Duval Street, Mallory Square, and everywhere around Key West with ease for shopping, lunch, dinner. Great location!!!! Have already shown all my friends pictures of this cottage! Getaway in Key West We loved staying here at the Mango Cottage. It is beautifully decorated. Kitchen had everything we needed. Beds were extremely comfortable. We also loved the cuban place just up the street. Their cuban sandwiches and cuban coffee are wonderful. You really don't need a car where this house is situated. We road bikes everywhere. The bike rental shop is practically across the street. We loved this cottage and hope to make it back for a much longer stay next year! Excellent vacation home! 5 Stars All the Way!!! I really was comfortable at the Mango cottage, felt like home but better. I loved how nice the home was. I used the hot tub every morning and every evening, nice touch. Close to the action but enough away that you got a feel for what the locals experience. Loved the cool cuban place right around the corner, and grocery and bike rental same block - perfect. The after hour person was very responsive and even recommended restaurants for us. The vegan restaurant he recommended, The Cafe, was another excellent choice. The house, the recommendations, all made for a perfect Key West get away. Something for everyone.